With our busy lives, it's pretty easy to fall into the "fast food trap". You know, when you are totally short on time and have to resort to grabbing a bite that is usually unhealthy more often than not. Hey, don't get me wrong here, I don't mind the occasional burger, but it's not a great way to keep nourished daily. 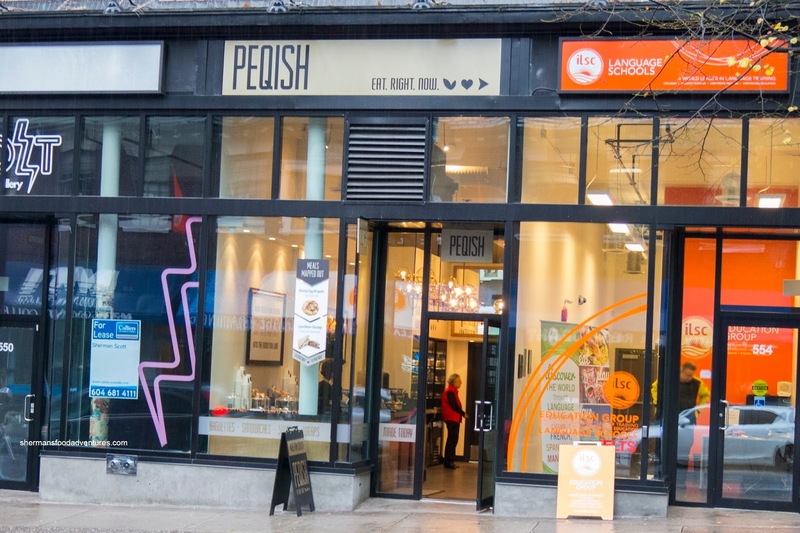 So when I was contacted to check out Peqish and their array of grab n' go items (that didn't include burgers), I was intrigued. I enlisted the help of Sean and Grace as well as Viv to try more than a few items. 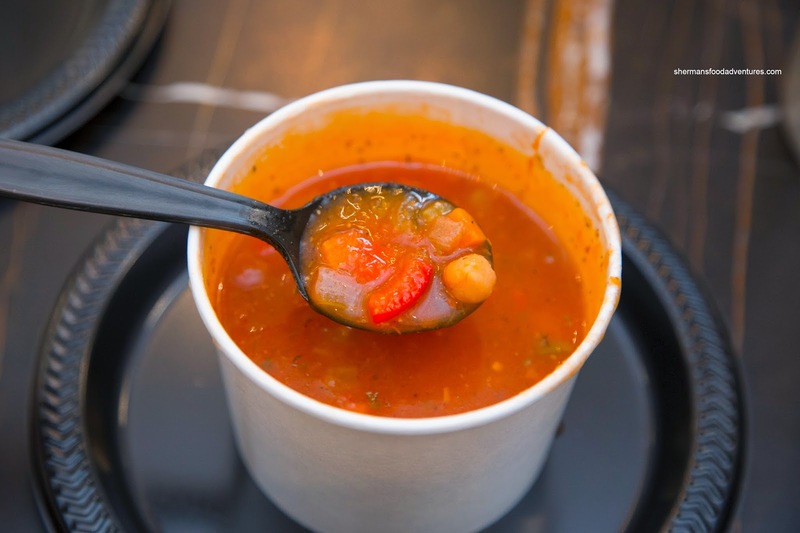 In addition to their selection of salads, sammies and drinks in the display fridge, there was also a warmer that offered up hot soups, sandwiches, baked goods and treats. 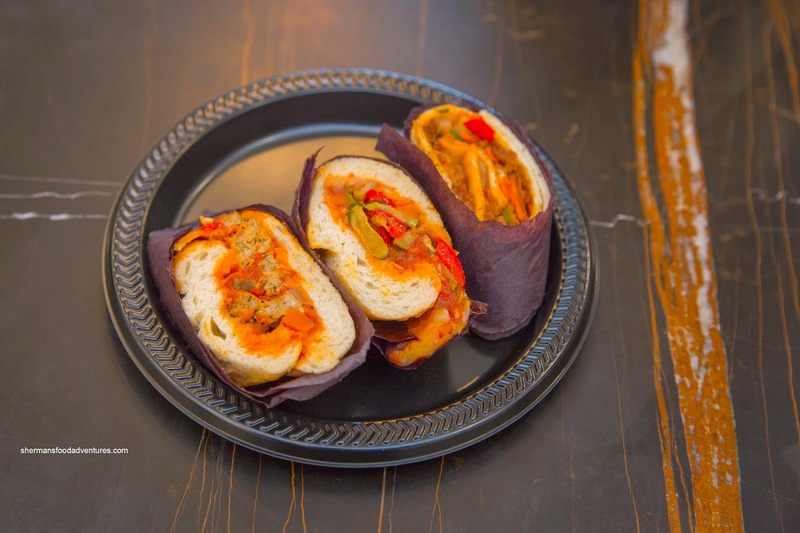 We sampled 3 sandwiches to start including the Turkey Meatball Marinara, Veggie Caponata and 5-Spiced Pulled Pork. These were indeed warm where the bread was a bit dry on the outside as a result of being kept in the warmer. I liked the pulled pork the most as there was a nice mix of five spice and sweet hoisin. Onto some soups, I tried the Rosemary Minestrone first. I found it quite mild with little nuggets of sweet veggies including carrot, corn and red peppers. There was a certain wholesomeness to it where it was easy on the sodium. 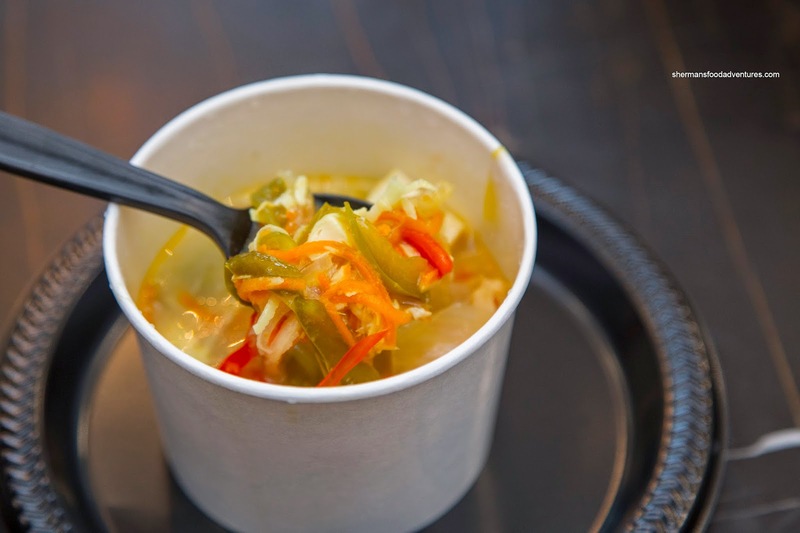 Onto 2 more soups, we tried both the Coconut Thai Chicken & Tofu Soup and Pumpkin Patch Soup. Although hearty and substantial, the coconut Thai was a little mild in flavour. It did taste fresh and healthy though with a certain brightness. I would've liked to see some more coconut essence as well as a touch of spice. 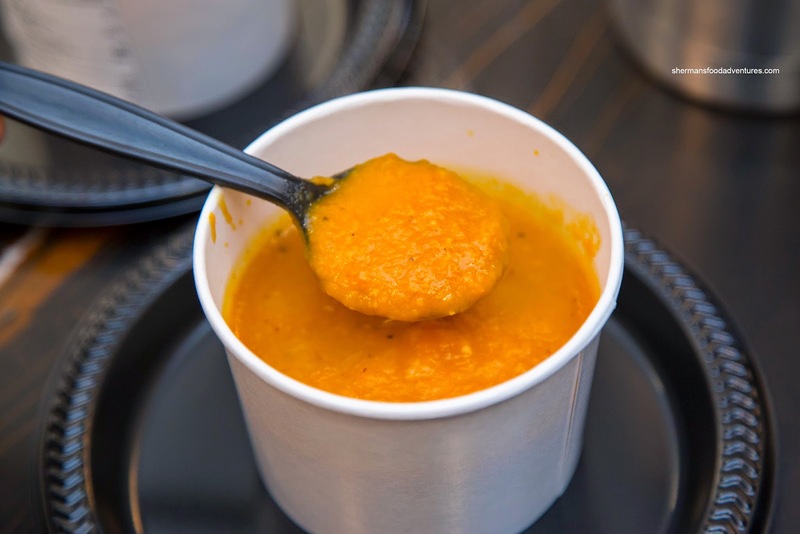 The most memorable was definitely the Pumpkin Patch Soup with carrot and ginger. I normally look forward to pumpkin soup as much as a vasectomy, but this one was different. The sweetness of carrots and the sharp spice of the ginger brought the flavours alive as well as masking some of the "vegetable gaminess" of pumpkin. Hey, we couldn't get out of there without trying some beverages right? We sampled (from left-to-right) the Berry Berry Banana Smoothie made with field berries, banana, orange and pineapple juice, Ginger Berry Chia H20, Ice Tea Lemon Crush Chia H20 and Mango Coconut Water. As much as I was apprehensive about the chia in terms of texture, it wasn't an issue as it went down easy with the drink. The common theme was that each drink had a certain flavour without being reliant on sugar. My favourite was the Ginger Berry Chia H20 as it was refreshing with only a minimal sweetness accented by a ginger "bite". I was a bit indifferent with the Mango Coconut Water, not because it wasn't any good, but for me, it was more about essence than actual flavour. 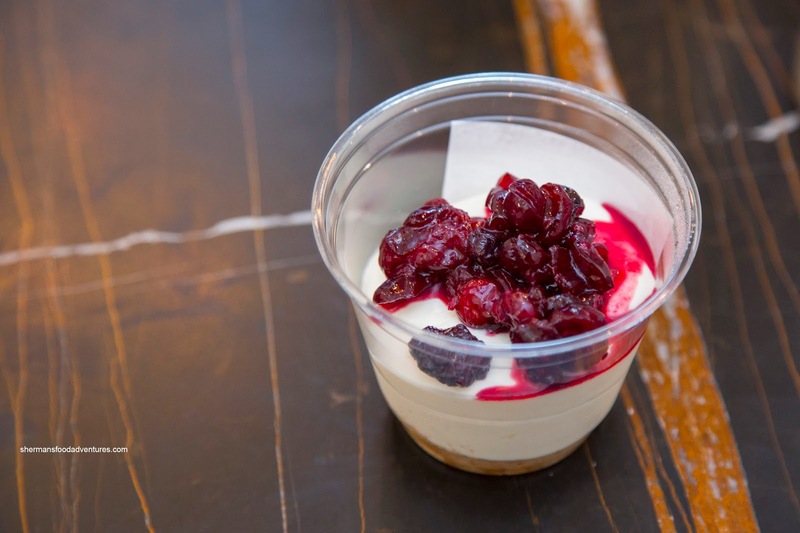 Moving onto some sweets, I had to go for the 5 Berry Icebox Cheesecake (because I love cheesecake... duh...). This was a lighter version with a "crumb dust" that wasn't heavy nor sweet. The cheesecake itself was creamy and not overly dense with only purposeful sweetness. This was complimented nicely by the semi-sweet and tart berries. 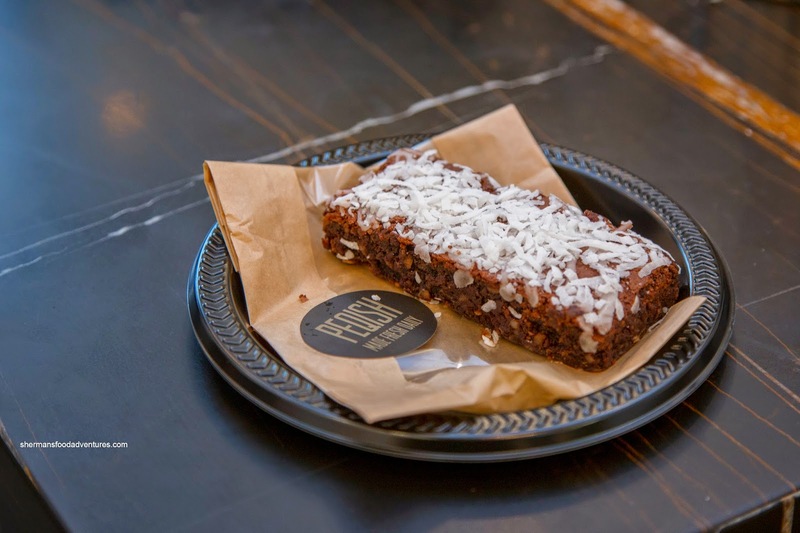 Sean was keen on trying the Crème de la Coconut Brownie. Turns out, it was pretty good as it was chewy, rich and of course coconutty. It was decently sweet without going overboard. However, I'm not sure if I could eat the whole thing by myself as it was quite filling. 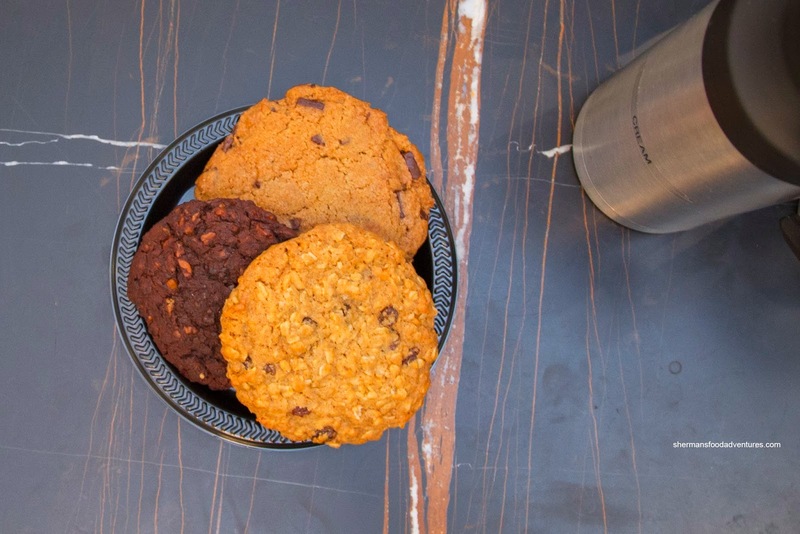 With a few more treats, we ended our tasting with a Iced Lemon Scone and a selection of cookies including Old Fashioned Chocolate Chunk, Lunchbox Coconut Oatmeal Raisin and Double Chocolate Super. The scone was kept in the warming display and hence was soft throughout. It was somewhat light with a sweet lemon frosting on the top. As for the cookies, I liked the chocolate chip the most as it was crispy with sweet chunks of chocolate. Naturally, the oatmeal cookie was chewy instead of crispy. It was fairly sweet, especially from the raisins. 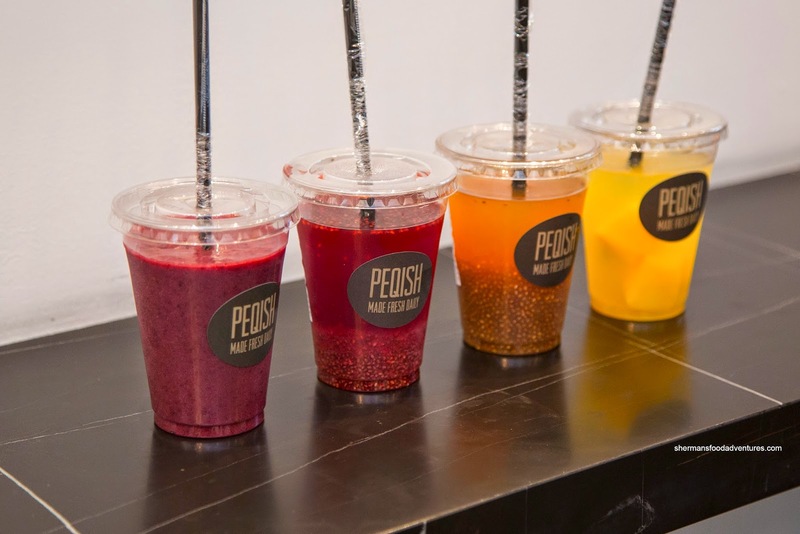 So as you can imagine, the food at Peqish isn't rocket science. 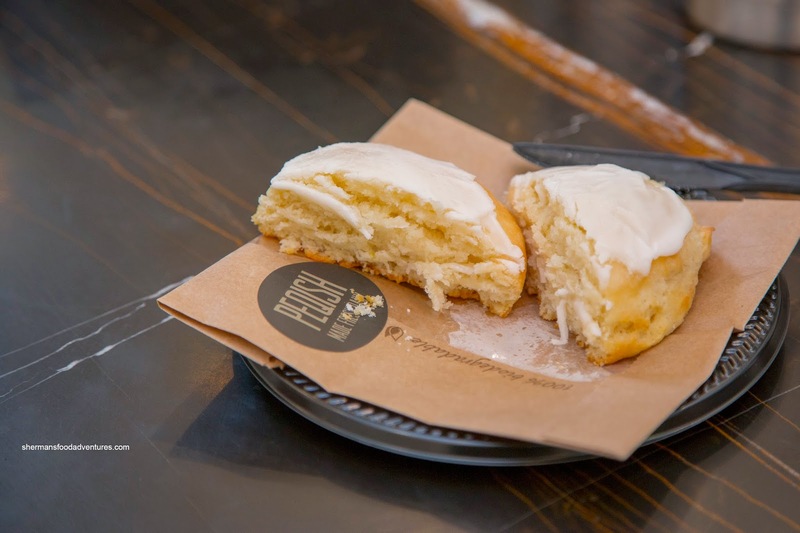 However, it is all made in-house and served fresh everyday. I especially liked the moderation with both sugar and salt in most of their products.